After a gloriously sunny morning slid into a rather wet and miserable afternoon, here are three mounted and framed Stephen Morris giclee prints waiting in the Gallery for collection by their new owners. They are going to be hung in a Hugh Town holiday let as a trio and a ‘Tower of Pebbles’ will also be going with them but mounted in terracotta for a different room. These three are actually all Porthloo paintings. 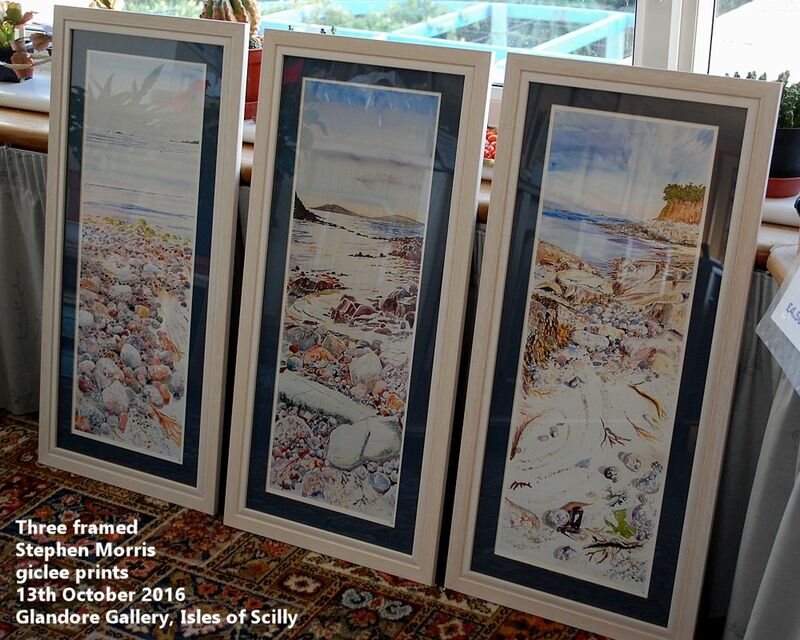 From left to right they are “Oystercatchers and Pebbles, Porthloo Beach”, “Amethyst Sunset” and “North Beach, Porthloo”, all mounted in blue and framed in cream wood. 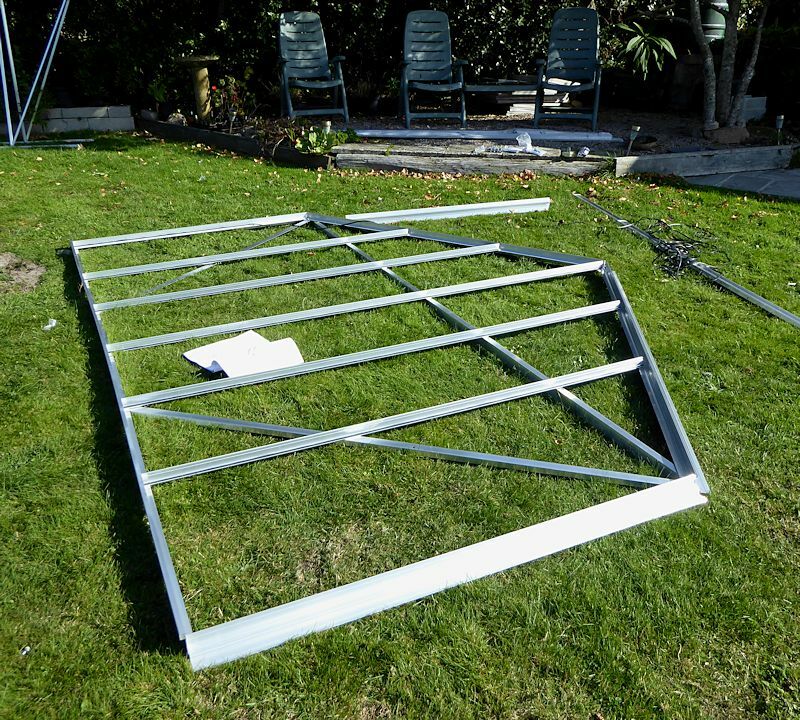 The weather has been really nice over the past few days and Stephen would really have liked to paint but he is helping our builders to construct Lois’ brand new greenhouse. It arrived flat-packed on the Gry Maritha last Friday and was delivered to us on Saturday. Now it is slowly taking shape at the bottom of the garden at Glandore, on roughly the same footprint as the Alton cedarwood greenhouse that was dismantled at the beginning of the week. That had stood there for over 27 years, withstanding sun, rain, gales (including some ferocious storms), frost, snow (VERY occasionally! ), sand, lichen, pine needles and the ‘deposits’ of our resident starlings and other birds. Sadly, it was rotting, sagging and becoming quite dangerous so Lois spent a lot of time moving tender plants up into the smaller greenhouse, crating up pots and other equipment for storage, tucking the hardier plants into sheltered parts of our garden and removing as much of the staging as possible. Then the stage was clear for the new production.